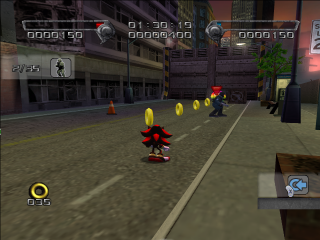 Westopolis is the first level of Shadow the Hedgehog, and due to the game's branching path structure, the only level which is mandatory on each playthrough. A city of the United Federation connected up by Lethal Highway, Westopolis is one of six urban centers hit by the Black Arms right at the start of their invasion of Sonic's world. Black Arms troops war against G.U.N. soldiers as the Black Comet showers the the city with laser impacts. In the middle of it all stands the amnesiac Shadow the Hedgehog, unable to understand what shreds of memory he does retain. In the game's opening cutscene, Shadow finds himself on the outskirts of Westopolis, waxing philosophical about just who he is. It is from here that the hedgehog watches with mild disinterest as the Black Arms' crimson clouds swirl over the city, disgorging alien legions into the heart of the metropolis. However, Doom's Eye swims over to meet the Ultimate Lifeform, and an apparition of Black Doom commands Shadow to gather the Chaos Emeralds "as promised" before flitting away. While he's not interested in following orders, Shadow reasons that whether he likes it or not, if Black Doom has knowledge about his past, then he needs to collect the Emeralds and put the alien to the question. Shortly after arriving in the city, Shadow runs into the one and only Sonic the Hedgehog, who wants Shadow to help him "show the black creatures that we mean business" by repulsing the invaders. Conversely, after Shadow grabs the first (green) Chaos Emerald, Doom's Eye approaches (commenting that he is "late"), and sets him with the task of destroying the GUN soldiers. It is up to the player to decide who to help; or to take the neutral route and just go straight for the second Emerald. Westopolis is still under heavy bombardment from orbital lasers as Shadow fights his way through the streets. Half-destroyed roads, buildings, and burning car wreckage litter the stage, and some buildings can even be seen toppling over during the stage. The 'Red Fruits', as they are called in-game, are found in small clusters at various points in the stage. There are some metal bridge like structures that are knocked down by the lasers that can provide alternative routes through the level. There are even some damaged buses that can be flipped over to crush foes, as well as speed limit signs that can be knocked down and subsequently used for bashing heads. As for the state of the city, the soldiers will sometimes comment that 'the entire city is on fire!' during the stage. In later cutscenes, a soldier informs the G.U.N. Commander that of the six major cities around the world which have been attacked, Westopolis has received the heaviest casualties, due to weakened defenses, and that downtown Westopolis is almost completely destroyed. This stage's secret door is located next to the fourth checkpoint, to the right. Inside is a G.U.N. machine gun and an Assault Truck. This page was last edited on 31 October 2017, at 18:14.